Dr. Robert Tallering is committed to providing excellence in dentistry, and stands out as a leading dentist in Highland. The doctor uses the latest in dentistry techniques to provide you with a beautiful and healthy smile. Additionally, Dr. Robert Tallering believes strongly in education to prevent oral health problems before they occur, and makes sure to keep patients fully informed about their dental health. 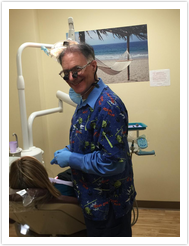 Read more about Highland dentist Dr. Robert Tallering below. Proficient in all phases of dentistry- restorative dentistry, root canal therapy, crowns and bridgework, cosmetic dentistry, children's dentistry. Prosthodontist - Implant specialist on staff: places implants as well as restores implants and bone grafting. Member of ADA, DSSNY, Third District Dental Society, Bronx County Dental Society and Phi Beta Kappa Society.